Maps tell stories. They tell stories of man imposing himself on the land, and the land imposing itself on man. Every map from every city is unique because each city has unique topographical limitations. The realities of the land dictate to designers the lay of the roads and bridges that define a city. The interplay of man’s navigation overlaid on the demands of geographic features creates interest and beauty from above. Initiators change maps. They meet the challenge of unique and varied landscapes with innovation and courage. They build. They change the map! What changes are you proposing for the world around you—for your friends and family and community? Roadways are named in honor of contributors—after big donors! What sacrifice are you making to change the map you have been handed? Each of our lives is unique from others in the way that city maps are defined. We each deal with our personal realities. We learn to navigate the immovable, the unchangeable features of our lives. It is what makes people and communities and extended families interesting and beautiful. Change your map! Paul Michael Cook finds beauty in maps. Inspiration for the oil paintings comes from the stories of cities or personal interaction with locations. A mixture of historical and current maps is used. Often Paul embeds bits and parts or even whole maps in the works. 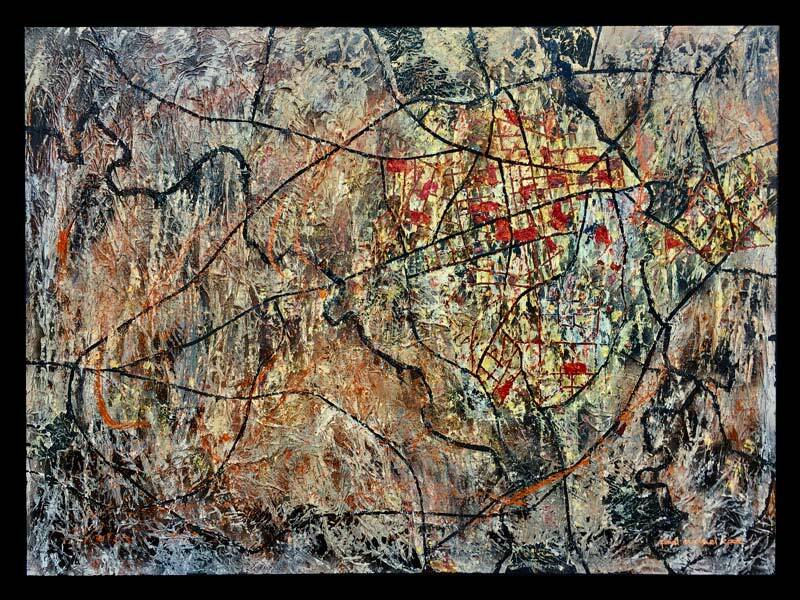 The stylized map paintings are layered and highly textured. To commission Paul Michael Cook to paint a custom “Map Series” art piece that has a unique meaning to you and your family contact Paul. Commission a custom map painting of your favorite city.